It's a familiar moment. The Duchess of Cambridge arrives at a grand white-tie event at Buckingham Palace wearing a tiara made of diamonds with suspended pearls, and social media (and the press!) goes wild: "Kate's wearing the Cambridge Lover's Knot Tiara!" Except -- she's not! The tiara worn by Kate -- the same tiara also worn by Princess Diana, Queen Elizabeth II, and Queen Mary -- is Queen Mary's Lover's Knot Tiara. The Cambridge Lover's Knot Tiara is an entirely different tiara, owned by a noble family in Germany. Today, we're going to break down the reasons why many persistently call the tiara worn by Kate and Diana by the wrong name, including comparison photos to show the difference between the tiaras. To fully explain the difference between the two Lover's Knots, we need to travel back about two centuries, to the time when the Hanoverian dynasty ruled in Britain. In 1818, King George III's son, the Duke of Cambridge, married Princess Augusta of Hesse-Kassel. 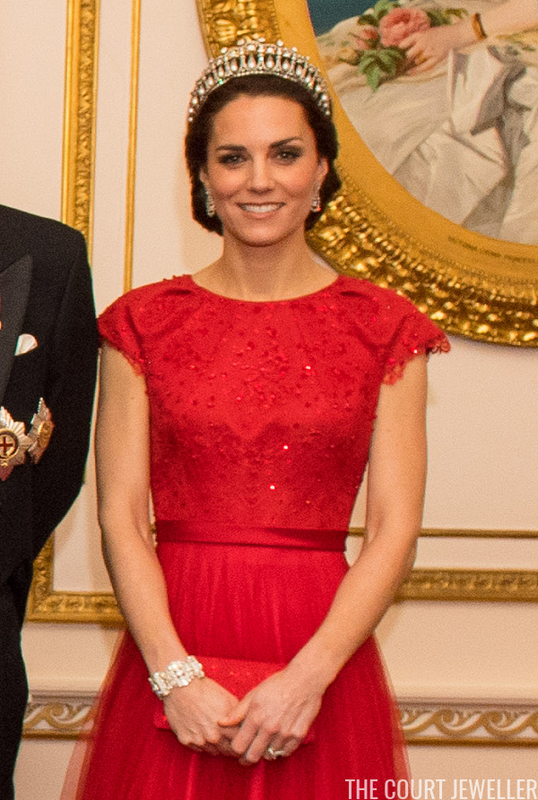 One of her wedding presents was the Cambridge Lover's Knot Tiara. In 1858, Augusta passed the tiara along to her daughter, the Grand Duchess of Mecklenburg-Strelitz, who wore it often. 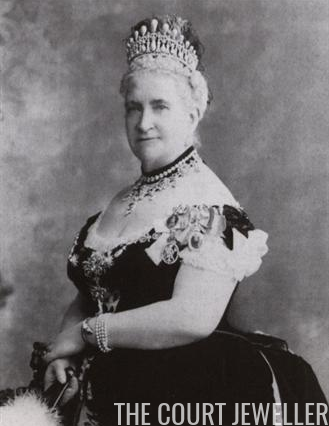 The Grand Duchess's niece happened to be none other than Queen Mary, who absolutely loved the Cambridge tiara. But Mary didn't inherit it; instead, it was passed along to the Grand Duchess's granddaughter and then was eventually sold. 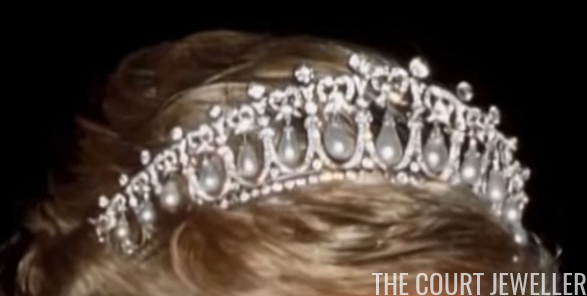 In 1981, the Cambridge Lover's Knot Tiara was sold at auction at Christie's in Geneva. The purchasers were German nobles, Georg and Marie Gabrielle von Waldburg und Zeil. Today, the tiara is worn by their daughter-in-law, Mathilde. 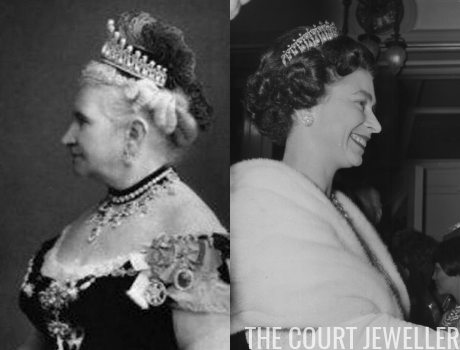 But Queen Mary loved the tiara so much that she ultimately decided to have a copy made for her own collection. (She wasn't the only one. There are several more lover's knot tiaras out there.) The work was done in 1913 by Garrard, using diamonds and pearls taken from other pieces of jewelry. Initially, Queen Mary's Lover's Knot Tiara was also topped by a series of upright pearls. 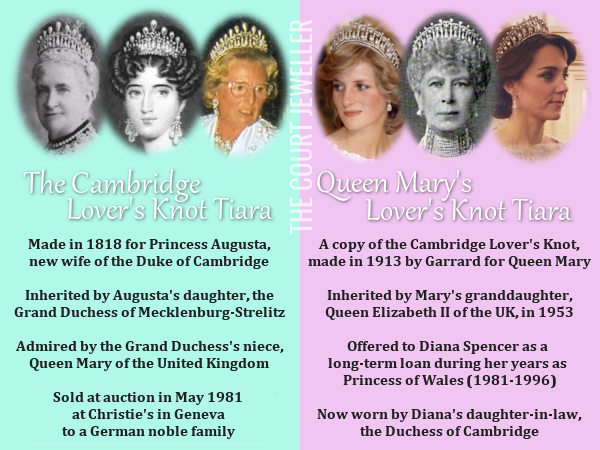 She later had those removed, so that's the easiest way now to tell the difference between the tiaras: the Cambridge Lover's Knot has upright pearls, while the Queen Mary's Lover's Knot does not. Mary bequeathed her own Lover's Knot to her granddaughter, Queen Elizabeth II, in 1953. 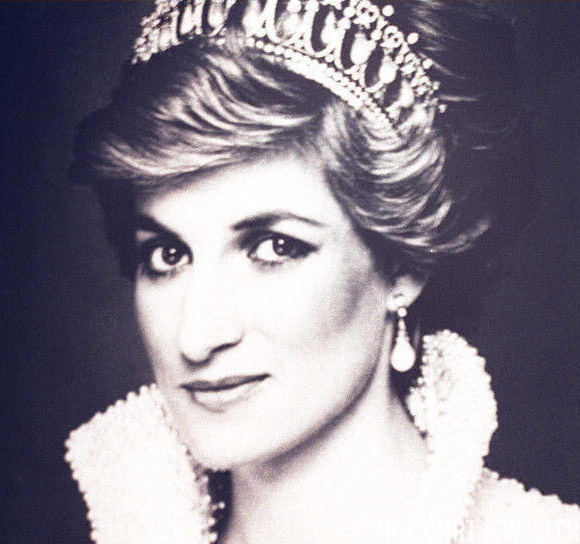 In 1981, Elizabeth gave the tiara as a long-term loan to her new daughter-in-law, Diana. At this point the tiara began getting a lot of press, because people loved writing about Diana's jewels and fashion, and many of them mistakenly called the tiara "the Cambridge Lover's Knot" rather than using its correct name. She wore the tiara while she was Princess of Wales, but it returned to the palace after her divorce and death. Now, it's been loaned to Diana's daughter-in-law, the Duchess of Cambridge. In 2012, the royal collection settled the name question once and for all in The Queen's Diamonds, where the tiara worn by Mary, Elizabeth, Diana, and Kate is clearly labeled "Queen Mary's Lover's Knot Tiara." So, next time Kate pops out in the tiara, you'll know precisely what to call it. To help out even more, I've put together a handy infographic to show the difference between the pieces. So now you know! The Cambridge Lover's Knot is older, has upright pearls, and lives in Germany. Queen Mary's Lover's Knot is newer, has no upright pearls, and lives in the British royal vaults. Easy peasy, right?